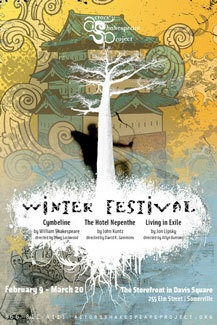 The final production of The Actors’ Shakespeare Project’s Winter Festival was Living in Exile. The production hit roadblock after roadblock on its way to the stage, including an actor’s major injury, a weeklong postponement and the death of the playwright, Jon Lipsky. But when I finally got to see the show last Sunday, it was none of those things that got in its way. The play itself just wasn’t as good as the two superb shows I’d seen earlier in the Winter Festival. A modern re-telling of the Iliad, the fascinating story is presented by two actors in one confusingly dull 2 act play. The triple casting of the male lead (Achilles, Agamemnon and Patroklos) is befuddling from the get-go as his characters begin to blend into each other. But the biggest problem with the script is the way the story is told. It’s at its best when the characters engage each other in a scene, but most of the play is a series of long monologues, telling us the story instead of showing it to us. The whole thing seems more like it belongs in novel form (with a proper narrative voice), instead of presented on stage. The actors, too, created a strange dynamic in which their technical skills were obvious but they still somehow fell short. Robert Walsh, one of the ASP’s resident powerhouses, was confined to a wheelchair for the entirety of the play and managed to not be hindered by it at all. The expressive actor’s strong vocal and facial control really showed, but there were few moments when he made me really feel for his characters (though there were a couple- all as Patroklos). Tamara Hickey as Briseis had even less success moving me, though her strength and commitment easily proved impressive. The play was strangely set in a living room and employed what seems to have become the ASP’s go-to device of symbolic, almost Brechtian sound from visible actor/musicians offstage. In fact the night’s most impressive performer was one of these musicians, Ruby Rose Fox, who voiced everything from deathly arrows to haunting soundtrack to the offstage voices. Fox was a highlight in this incarnation of a device that was significantly more effective in Cymbeline only a few weeks earlier. Overall, Living in Exile didn’t live up to any of its potential, making it easily the weakest link in an otherwise truly excellent Winter Festival.